Stark, dark and menacing, the Jim Root Jazzmaster has got to be the most distinctively minimalist version of the instrument ever devised in the model's entire half-century history. At the behest of the towering Slipknot/Stone Sour guitarist, gone are the dual tone circuits and barrage of controls. Gone are the fret position markers and enormous chrome bridge. Gone, in fact, is pretty much everything typical of a Jazzmaster guitar, replaced only by fearsome EMG 60 (neck) and 81 (bridge) humbucking pickups with brushed nickel covers, a single three-way switch, a single volume knob and a hard-tail Stratocaster bridge. 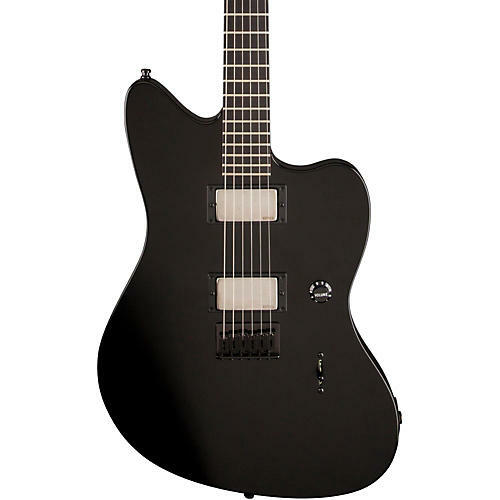 The Jim Root Jazzmaster also features a mahogany body with a comfortable contoured neck heel, satin-finish maple neck with "modern C" profile and large headstock, compoundradius ebony fingerboard (12"-16") with 22 jumbo frets and no position markers, staggered deluxe locking tuners, black hardware and pickup bezels, and an austere Flat Black satin nitro lacquer finish. Includes black tweed case with red plush interior, strap and strap locks, cable and polishing cloth.